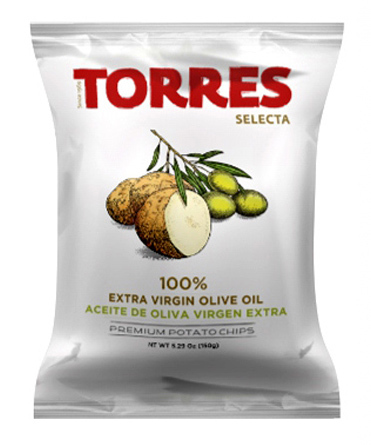 Home » Pairings » Archive by Category "Selecta Potato Chips 100% Extra Virgin Olive Oil"
Heat the oven to 180ºC. Cut the zucchini squash into very thin slices, brown them lightly in a skillet and set aside. Dice the onion and saute it until golden brown in color and set aside. In a heat and oven-safe glass pan, place one layer of Torres Selecta 100% Extra Virgin Olive Oil potato chips, one layer of cheese for melting, one layer of onion, and one layer of zucchini squash. Repeat the layering process again, one layer of potato chips, followed by one layer of cheese for melting, one layer of onion, one layer of zucchini squash, and lastly sprinkle the top with grated cheese covering the entire surface. Bake for a few minutes until the cheese melts and you will have a quick and original lasagna made with Torres Selecta potato chips that will surprise everyone.